What to bring on a canoe or kayak trip. Outdoor adventures are always more enjoyable if you have the proper clothing and equipment. 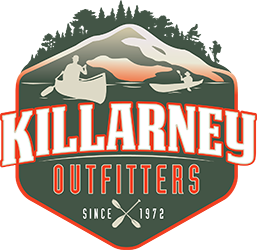 The following list is a basic guideline that will enhance your Killarney experience. We have all of these items available for sale in our store. Please don’t hesitate to contact us with any questions you may have. The importance of good raingear cannot be stressed enough. Choose a rain jacket that is constructed of waterproof fabric. Gore-tex works well, and foul weather gear made for sailing is durable and comfortable. Bring synthetics, polypropylene, or wool clothing to wear under your rain gear. Cotton doesn’t dry quickly so we don’t recommend it for your trip. Synthetic materials are a better investment. You may not need to bring your rain gear out of your pack; however, you’ll be warm and dry in a downpour if it occurs. Quick-dry nylon pants and shorts are perfect for our environment. A popular choice among guides and customers are the quick-dry pants that zip off and double as shorts. Synthetic shirts in long and short sleeves keep you dry and also insulate your body. Paddling activities always mean wet feet; for daytime paddling sport sandals are a popular choice, as are neoprene booties. For land or camp wear, bring a pair of stiff soled light hiking boots or shoes. Use our equipment list as a guide and please call us if you have any questions. Day pack capable of holding rain gear, camera, lunch, sunscreen, etc.